Absolute Brilliance is the retail jeweler's premier choice for special order loose diamonds. Competitive pricing, immense on-hand inventory, and a commitment to excellent customer service makes ABI an industry leader. Our personalized, individual service and custom tailored programs assist the retail jeweler in growing sales and creating life-long customers. 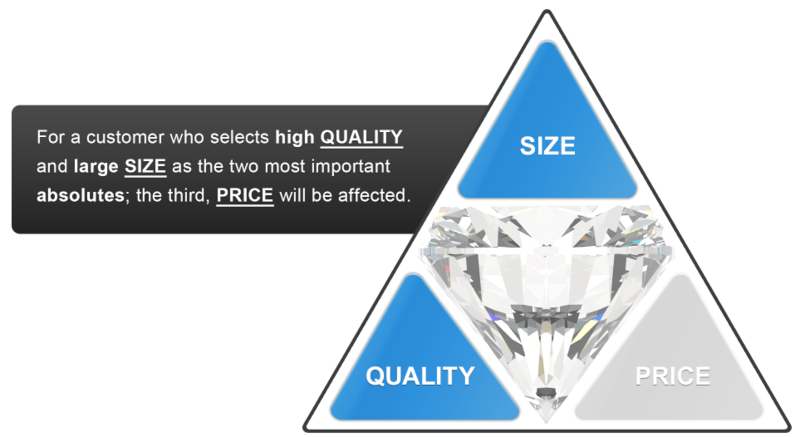 A critical value factor of assessing a diamond is its cut. 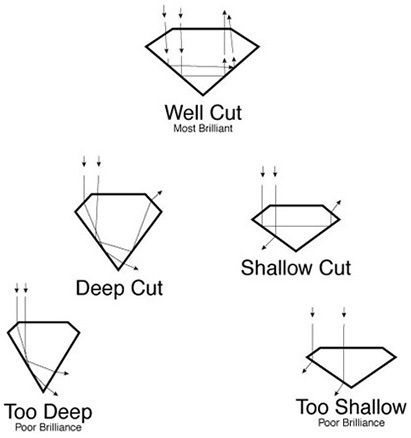 Cut describes the proportions, balance, symmetry and polish of a diamond not its shape, such as round or oval etc. Cut determines how that diamond will come to life the brilliance, fire and scintillation that is unleashed when the diamond cutter brings his or her talents to the stone. This C may be the most challenging to fully grasp because so many components must come together to determine the cut grade. A diamond is critically assessed by every facet from top (crown) to bottom (pavilion). The goal of a well cut diamond is to return the maximum amount of reflected light back to the viewer's eye so that the diamond will sparkle brilliantly. Color should not be confused with clarity. Color means the body-color of the diamond crystal itself irrespective of its clarity. To the untrained eye, a colorless but heavily included or low clarity diamond can be mistaken for a grayish or brownish body color diamond. With the exception of fancy color diamonds (those with prominent hues like yellow, pink or blue) diamonds are prized for their lack of body color. The closer a diamond crystal is to being colorless, the more valuable it is. 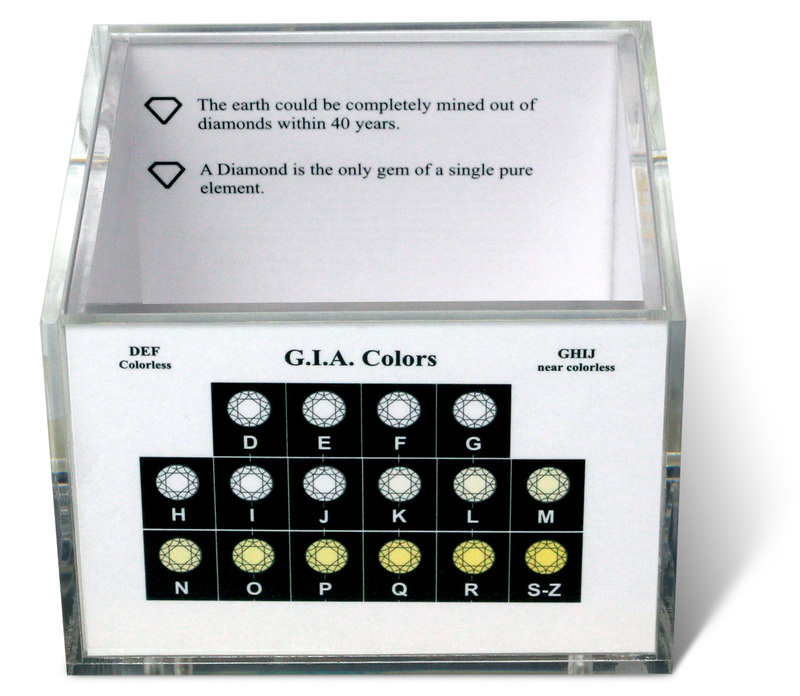 The D to Z color scale devised by GIA assists in communicating the color grade of diamonds. D represents absolute colorless diamonds while Z indicates the most body color observed on this scale. Professionals use a set of master stones in a range of verified colors to compare with diamonds they are examining to assign its correct color grade. Clarity expresses a diamonds absence or presence of internal and external characteristics, called inclusions, or blemishes. Since diamonds are a naturally occurring gemstone crystal, each stone will have its own distinct internal appearance. It's exceedingly rare for a diamond to occur without some inclusions. 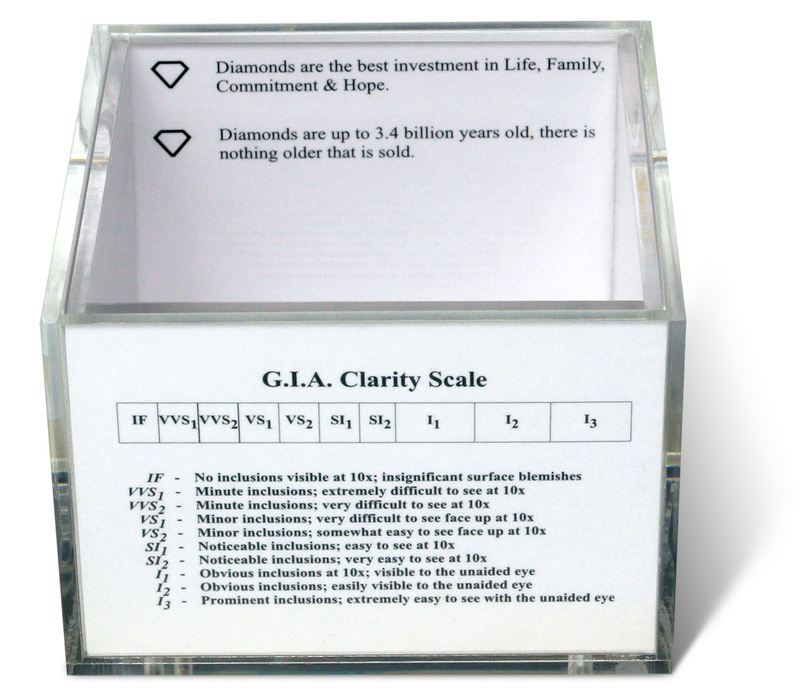 The Gemological Institute of America (GIA) has created the most universally accepted clarity grading system to standardize the way in which a diamond's clarity is expressed. Clarity grading is conducted under a 10X magnification instrument. Keep in mind that inclusions may be light or dark in color. They may also be less or more prominent depending on their location within the stone. So a diamond in the SI range may be a very desirable stone if its identifying characteristics are not prominently located in the table facet or center of the stone, and particularly if the inclusions are not dark. F (Flawless) Free from all inclusions & blemishes at 10X. IF (Internally Flawless) No inclusions visible at 10x minor surface blemish. VVS1 (Very Very Slightly Included) Minute inclusions; extremely difficult to see at 10X. VVS2 (Very Very Slightly Included) Minute inclusions; very difficult to see at 10X. VS1 (Very Slightly Included) Minor inclusions; difficult to see face up at 10X. VS2 (Very Slightly Included) Minor inclusions; somewhat easy to see face up at 10X. SI1 (Slightly Included) Noticeable inclusions; easy to see at 10X. SI2 (Slightly Included) Noticeable inclusions; very easy to see at 10X. I1 (Imperfect) Obvious inclusions at 10X visible to the unaided eye. I2 (Imperfect) Obvious inclusions; easily visible to the unaided eye. I3 (Imperfect) Prominent inclusions; extremely easy to see with the unaided eye. The word carat is an expression of a diamonds weight, rather than its size. With a well cut diamond, we may also have an idea of its millimeter size when hearing the term "one carat" etc. 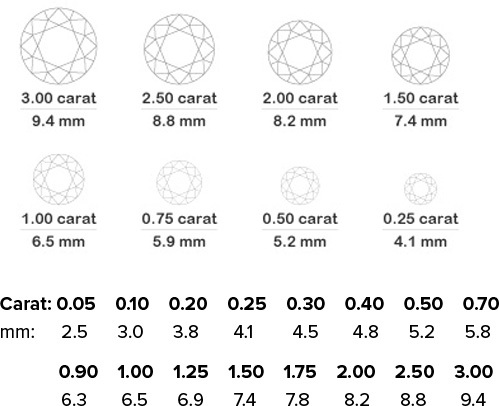 Carat weight is most popularly expressed in fractions, such as 1⁄2 carat. It may also be expressed in a points system where 100 points equals 1 carat. A .50 or 50 pointer means that the diamond is 1⁄2 carat. 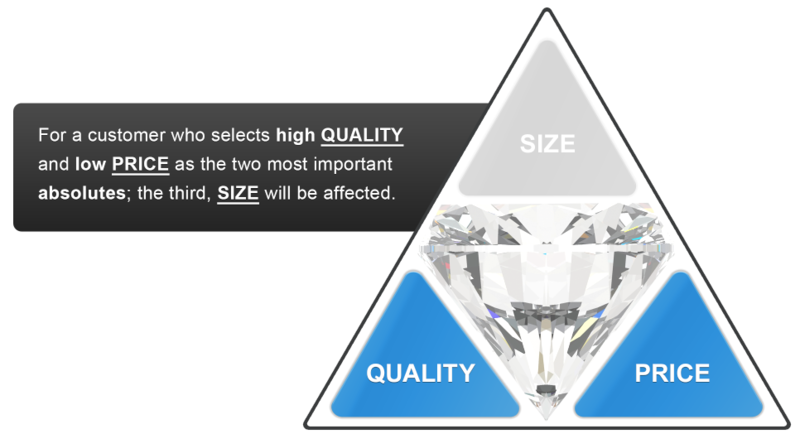 When the quality components of a diamond are equal, the larger the carat weight, the more valuable it is. 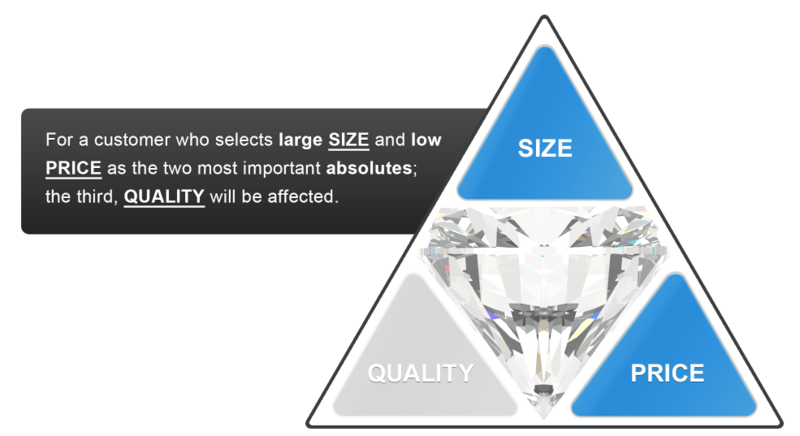 There is a direct relationship of increased size to rarity with all diamonds. We have added a 5th C to our diamond evaluation system to show how important we feel confidence and trust is in every diamond transaction. Confidence and trust are earned attributes, and ones that we have faithfully acquired over the years–one diamond occasion at a time. We know what's important to you and your customers, and we've committed ourselves to being there before, during and after the sale. Personal service and values set us apart from the competition and establish loyalty from each of our valued customers. In this age of runaway technology, we still believe in personal one-on-one service. Just as every diamond is distinctive with its own unique traits–so are our customers. We are dedicated to maintaining that personal interaction to serve our customers by providing the highest level of customer care with diamonds that will be treasured for a lifetime. That's what Confidence and Trust means to us–and what you can count on. Our immense on hand inventory that covers virtually any request your customer may ask for. When you're getting a quote from our customer service representatives, they are holding the actual diamond in their hands and can personally describe it to you! Many other companies don't own the diamonds; they source them from other places. So you can cut out the middle man and come directly to us, the manufacturing source. Our very competitive pricing. Because we own our entire inventory and have a desire to move it, you receive the highest quality diamond at the lowest possible price. Our diamonds truly are as unique as your customer's reasons for wanting one. Each diamond is rigorously examined before it is made a part of Absolute Brilliance's inventory. Our expedient delivery of diamonds to your store, in most cases within 24 hours! 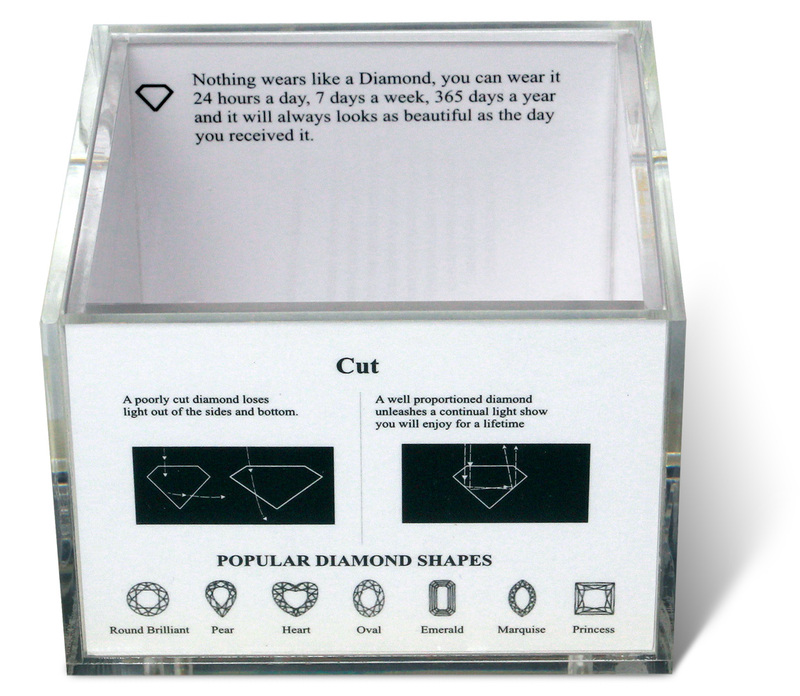 Our innovative sales tools were created to assist the store associates in selling more diamonds. The Absolute Cube, The Absolute Triangle, The Absolute Ruler, Brilliant Tips, The Diamond Qualifying Card, and More! Our reputation within the jewelry industry. Only a limited number of loose diamond manufacturers can fulfill the ethical standards needed to hold the title of "Registered Supplier" of the American Gem Society (AGS), have G.I.A. Graduate Gemologists on staff and be a member of the G.I.A. Alumni Association. 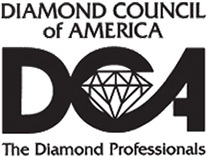 Our involvement in The Diamond Council of America. Absolute Brilliance is on the Board of Directors/Executive Committee of the D.C.A., a not for profit organization providing affordable quality education that enhances the professionalism of you, the jewelry sales associates. Everything we do is always centered on you… our customer. From a live receptionist answering your first call, to our personalized customer service representatives and thorough follow up after the sale, Absolute Brilliance's goal is to exceed your expectations every time you call us! No one else even comes close! A recent survey showed 89% of our sales come from repeat stores or referrals from other satisfied store managers. That says it all! Who is the retail customer that might need a hand selected loose diamond from Absolute Brilliance? Every diamond customer that walks into your store is a potential Absolute Brilliance special order sale. Thank you for requesting an account. We'll be in touch! Call us 800-309-0040 | Please log in to view sales training aids. © 2019 Absolute Brilliance, Inc. All Rights Reserved. 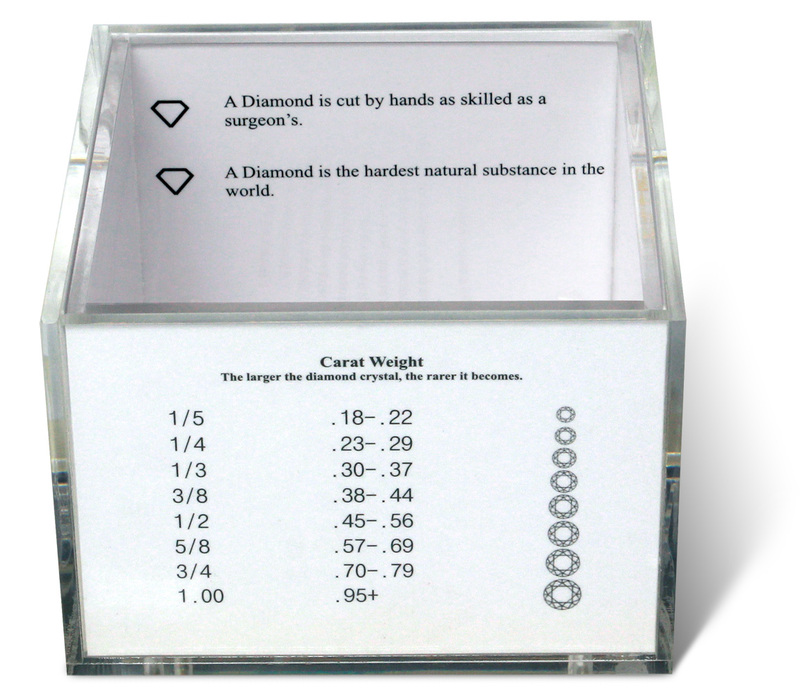 The Absolute Cube, with several diamond facts and details about the Five C's, is a great sales tool for any diamond jeweler. The Absolute Ruler visually depicts carat weights for most shapes right on top and is a length of 15in (38cm) for all your measuring needs.